Brinjal rice, when I already have so many versions of it. That must be enough to try in a while, yet I find that my parents get brinjals without fail whenever they shop. While Hubby dear isn’t either fond or not towards this vegetable, I end up making it once a week. So having a quick and simple rice dish is your answer for a quick dinner. While the other versions of vangi bath calls for the typical Vangi Bath masala, today’s recipe is as simple as you can get. While on the topic of easy and quick dinners, I had an entertaining talk with my uncle. He got transferred to a new place where he has to cook for himself. So I was very interested to know what he cooks and he said I will be shocked hearing his ideas. Shocked was right, however I was taken in by the whole idea as well. I was chopping Indian Broadbeans and he shared how he cookes it. He follows a basic step for all his dinners. Saute the tempering ingredients, followed by the vegetable, spices and garam masala, if using. Then soaked rice, followed by water and salt. Pressure cook everything together. While I can imagine this for a mixed vegetable to make a pulao, I was finding it hard to imagine with cluster beans of Indian Broadbeans. He says the same formula is applied to all vegetables and shared few more tips for bacholor cooking. I know my mind was making leaps and bounds on how to improvise on the theme. I am sure you will get to read about it, when I actually make it myself! Now for the final Mixed rice, you have Brinjal rice! Heat a Kadai with oil, temper with curry leaves, mustard seeds, chana dal, cashews and saute well. Then add the whole garam masala and saute well. Now add the finely chopped onions, saute well. Next add brinjals that are chopped as juliennes, and add salt, turmeric powder. Let it simmer for a while. Then add all the spice powders, followed by the curds. Ensure you have the flame in low when the curds are added. Cook in simmer for 5 mins, until the masala is nicely cooked and brinjal gets soft. Now add the cooked rice and mix everything well. Cover for 5 mins and serve hot with curds and papad. so your uncle is following the OPOS method I believe! Good for him. 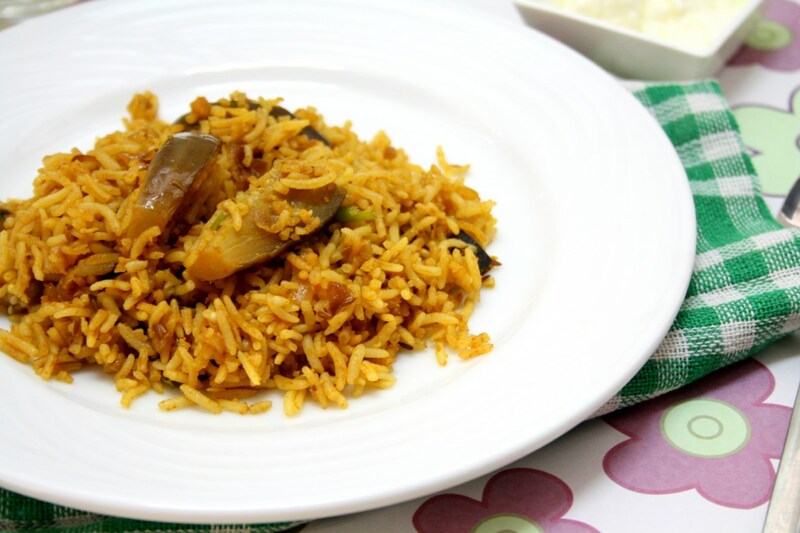 My husband would rather go hungry than cook a decent meal :D. The rice looks good, I use up brinjal in many ways, but rice is not a tested way. Should give it a try though! 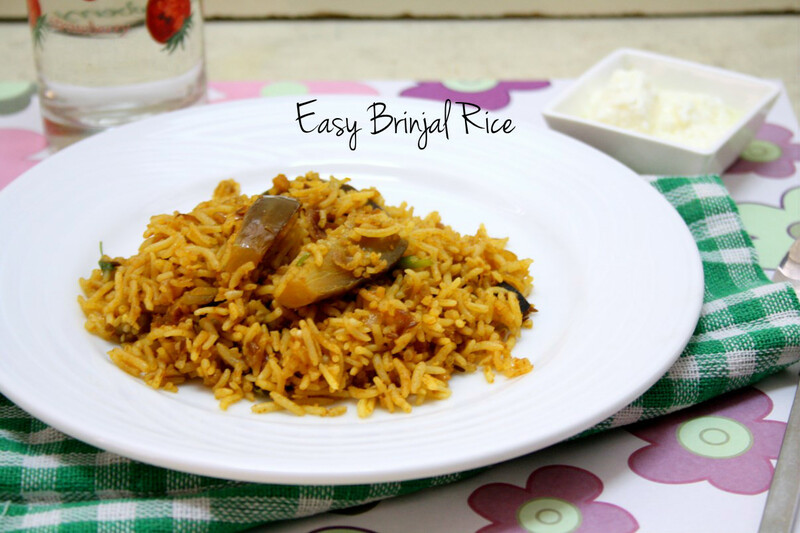 I have never tried any brinjal rice , somehow they aren't acceptable in the house . The Rice looks filling and perfect. Very tempting vaangi bhaath.Looks so delicious. Brinjal is very common in our home..it is my fav vegetable.. Will try this quick vanghi bhat soon.. It looks yummy. 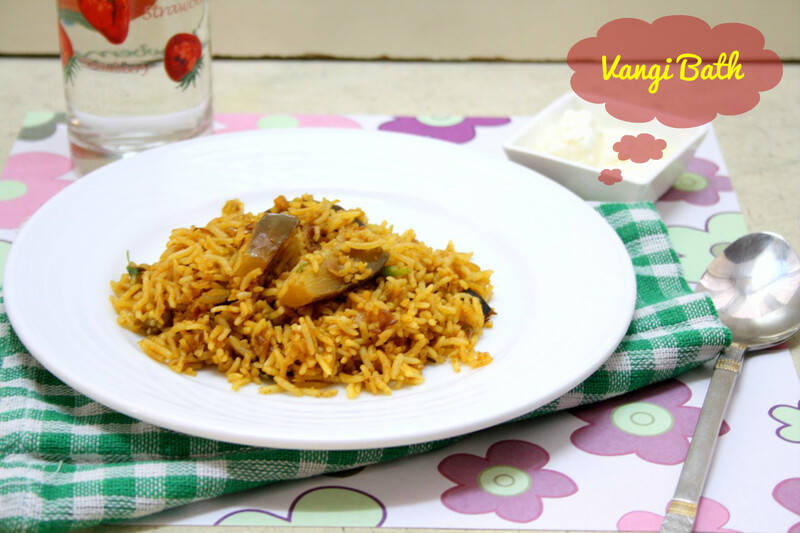 Yummy vangi baath….easy and yummy. I love this rice looks tempting, simple yet delicious.